There is an envelope in the mailbox. You pick it up, intrigued by its handwritten address. This is nothing you’ve ordered. It is an artifact from another time. You open it. A nearly monochromatic little comic slips out. Purple and white dominate the page. The paper feels raw, there’s no gloss to it, but also none of that try-too-hard matte. As you flip through it something else slips out, a postcard-sized print that only says “Nostalgic Blob.” You grin because that little blob gets you in too many ways. You proceed. 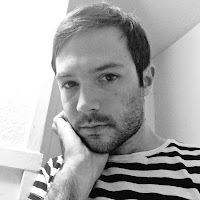 At that point, less than a year into Obama’s second term, the concept of “failed utopias” was more theoretical but, looking back on it now, it seems clear that Kaczynski instinctively knew catastrophe was looming and, more importantly, realized that it would come in large part because of our fetishization of a nonexistent, utopic past. 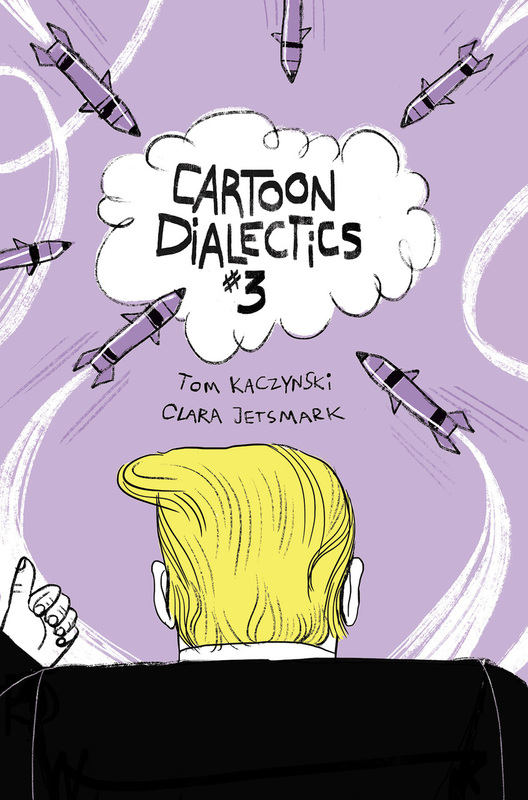 That aspect of Kaczynski’s vision, both as a comics creator and a comics curator, is most explicit in the opening story of Cartoon Dialectics #3, “Trump and Nostalgia,” created with Jetsmark for The Nib in October of 2016, shortly before the election when most experts emphatically stated Trump had no real hope of winning. Rather than tackle Trump’s prospects as a candidate, “Trump and Nostalgia” bluntly examines his now ubiquitous slogan at face value, wondering when the “Again” aspect actually refers to. 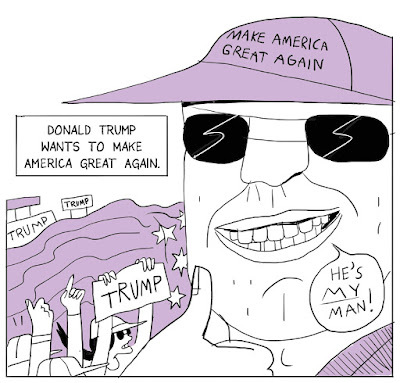 For most of the past couple years, The Nib has been a toothless, overly simplistic purveyor of progressive editorial cartoons, and though “Trump and Nostalgia” certainly doesn’t erase that history, it does serve as a reminder of what the publication is capable of when it is at its best. 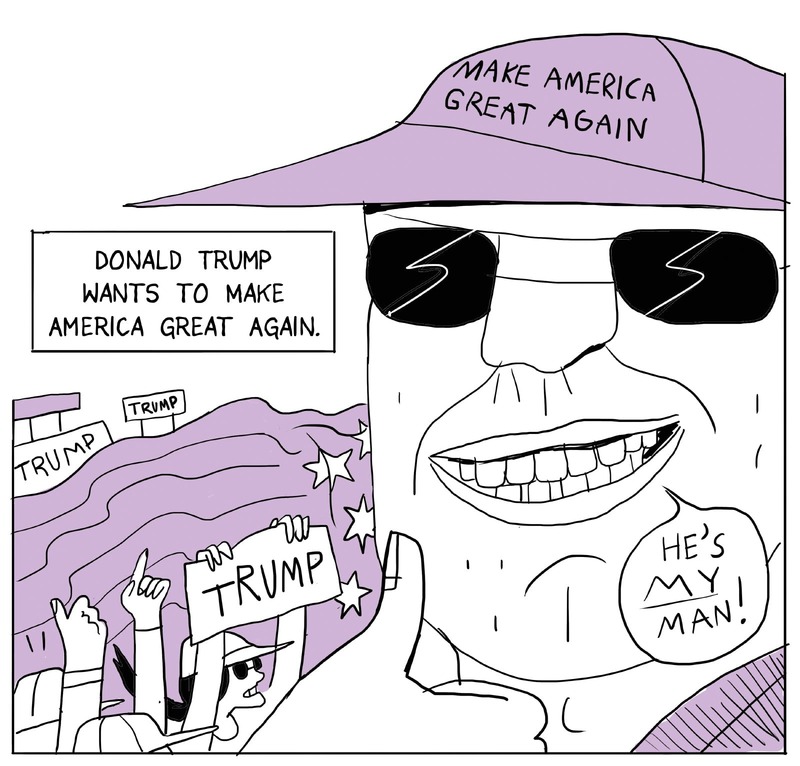 Avoiding the trap of merely stating some variation of “America has never been great/has not yet achieved greatness,” “Trump and Nostalgia” achieves the twin goals of proving the slogan’s vagueness is a core part of its success because it allows the target audience to fill in the blank themselves, and that for Trump, in particular, it hearkens back to the Reagan era both in terms of the semantics (it was lifted wholesale from a Reagan speech) and in terms of when Trump’s dog whistle politics actually became mainstream. The stark but emotive art helps the complexity of the “Trump and Nostalgia” arguments land with minimal effort. This is notable because even now, Democratic and Republican leadership try to argue that Trump’s approach to politics is new and unexpected, and that we must listen to his rabid base in order to appease them. In a mere 14 laid-back pages, Kaczynski and Jetsmark not only destroy that claim, they did so before the election even happened. The nostalgia half of the title, therefore, doesn’t just critique the bigots who voted in Trump, but it also critiques Democrats and Republicans both for nostalgizing a nonexistent time when politics were “clean” and naively falling prey to bad faith opponents. The follow-up to “Trump and Nostalgia” in Cartoon Dialectics #3, simply titled “Nostalgia,” has Kaczynski expertly laying out the culture-wide retromania that set the stage for our utopian aspirations to break down. Rougher in linework and more lecturely than Kaczynski’s usual material, “Nostalgia” nonetheless moves at a brisk pace as it details nostalgia’s growth from an actual malady afflicting touring Swiss mercenaries in the 17th century to its modern development as a viral, commercialized impulse. While it recycles some quotes and panels from “Trump and Nostalgia,” the section waxes more philosophical than historical, weaving in quotes from cultural theorists Svetlana Boym and Simon Reynolds, the latter of whom coined the term “retromania” specifically in regards to music but, as Kaczynski shows, it’s a useful theory for everything from politics to comics’ own terminal nostalgia infliction. 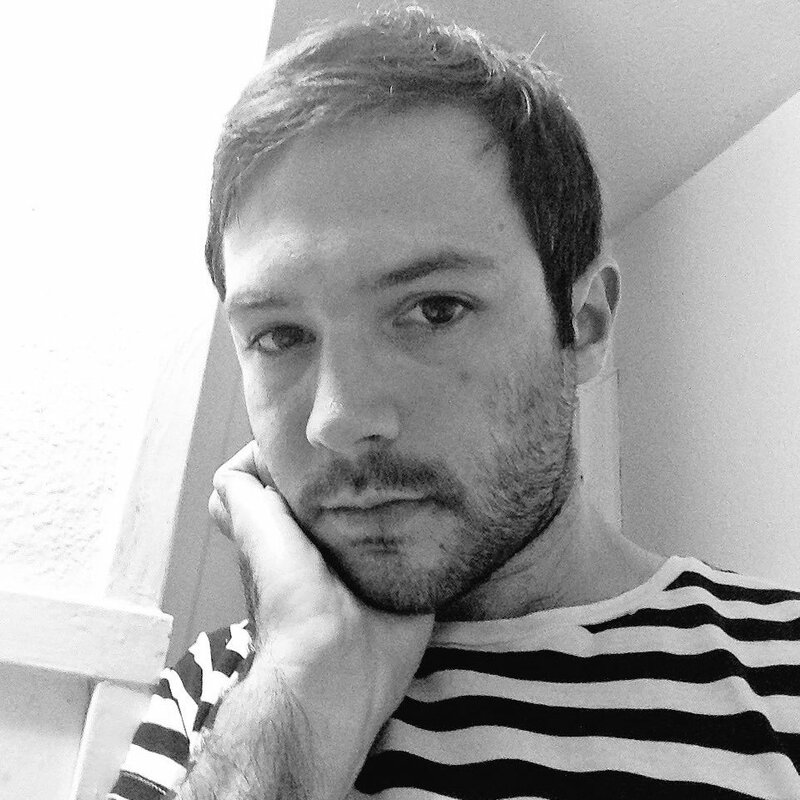 Kaczynski also connects Boym and Reynolds’ work to Alvin Toffler’s “future shock” theory which essentially states that as we become more technologically advanced, we will suffer a kind of cultural shock that will prompt many of us to latch on to regressive ideas and lash out at intelligence in general. Kaczynski’s style is perfectly suited to illustrating this phenomenon, with his lines seamlessly transitioning between architectural precision and scribbled looseness to drive home the escalating divisions between thought and feeling. 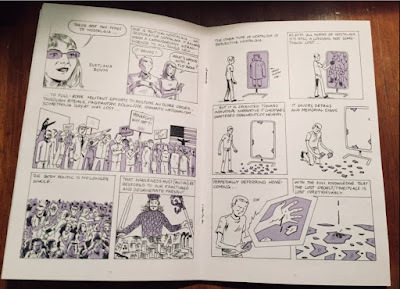 Later in Cartoon Dialectics #3, in “The Nostalgic-Critical Method: Praxis,” Kaczynski even provides some yoga-esque suggestions for recognizing and controlling your nostalgic impulses as they happen. The key, according to Kaczynski, is to allow yourself to notice the nostalgia as it appears and then isolate the memory triggered by it rather than simply giving in to the compulsion to purchase goods related to the nostalgia. That’s likely what Kaczynski is doing on some level with “Skyway Sleepless,” the fictional yet personal story that makes up the entire second half of Cartoon Dialectics. Set in a near-future city where people can live in “skyways,” bridge communities situated above and between streets that function a bit like terrestrial space stations, “Skyway Sleepless” is a love letter to Kaczynski’s own past as an architecture student. More specifically, it’s an intense and deep interrogation of Kaczynski’s internal architect/artist conflict. One of the first interactions in “Skyway Sleepless” is between the protagonist and Professor Ecke, who calls the protagonist his “best pupil” before immediately lamenting his protege’s choice to never become an architect. Prof. Ecke’s missing arm makes it clear he’s modeled on famed Minnesota architect Ralph Rapson, head of the University of Minnesota architecture program from 1954 to 1984. Kaczynski told me in that interview in 2013, before “Skyway Sleepless” was originally published, that Rapson’s academic interactions with Kaczynski, as well as his contributions to the aesthetic of Minnesota, had caused a fictional version of Rapson to loom large in his stories. 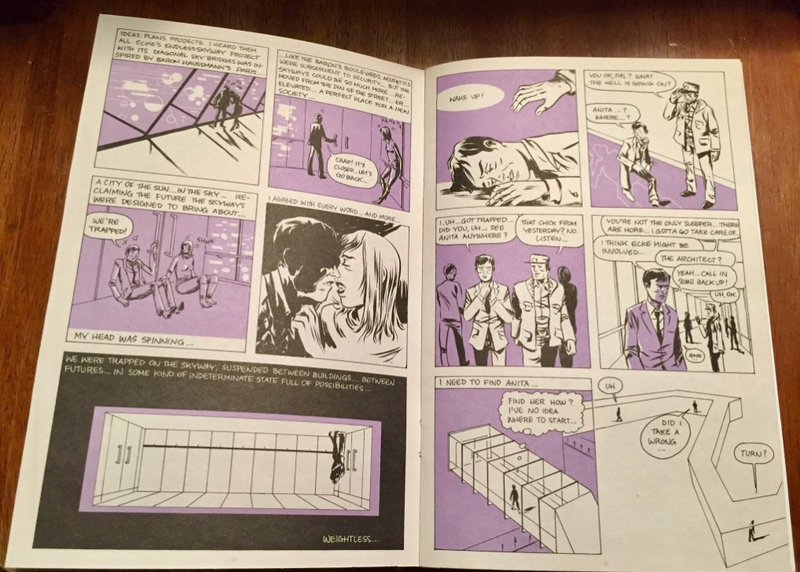 But “Skyway Sleepless” seems to confront Rapson’s influence on Kaczynski’s art far more directly than anything in Kaczynski’s other material, portraying Ecke as both a genius mentor and a villain of sorts, while the unnamed protagonist struggles to find his own identity within what is essentially Ecke’s city. “Skyway Sleepless” also provides an impressive platform for Kaczynski’s Escher-like tendencies, the titular setting twisting into physical and mental labyrinths, with Ecke at the center, putting the citizens to sleep as part of some grand artistic statement. That struggle is at the core of “Skyway Sleepless,” as the protagonist appears to lose his grip on reality as a result of probing it. But on the meta-level, it’s Kaczynski’s application of his own Nostalgic-Critical Method that is the driving force, isolating the memory of the person who had an influence on his meta-city fiction and confronting it rather than seeking out the more immediate pleasure of, say, a model of one of Rapson’s designs. The resolution at the end of “Skyway Sleepless” is as nebulous and mysterious as the nostalgic blob Kaczynski cutely drops into random panels, squeezing its way out of definitively stating whether the revived interest in Ecke’s design work is good or bad. But it fits perfectly with the question connecting all of Cartoon Dialectics: why do we keep returning to certain places, certain culture, certain objects, even when we know they won’t fix anything and might actually make things worse? And it’s even more fitting that Cartoon Dialectics offers no real answer, except that perhaps to overcome our past, we must look ahead more often than we look behind. You put the book down. You look at the old posters on the walls. The vinyl gathering dust in the corner. The trinkets on the shelves. You pick up the Nostalgic Blob print. You smirk. You stick it to the fridge. You stare at it. It reminds you of one of the ghosts that would chase Pac-Man in the arcade cabinet at the pizza place you used to go to after school. You wonder if maybe you can buy it as an enamel pin.